I’m back in the States after a 20-hour flight, four security check points, two luggage check-ins (for one fat bag), an extra charge for an obese suitcase and three cocktails from airports in St. Petersburg, Helsinki and New York. So far, I haven’t kept track of how many photos and videos I shot of St. Petersburg. I am working on few more photoblog entry about my Russian trip. 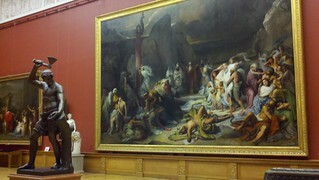 This one involves Andre’s adventure inside the Hermitage. ST. PETERSBURG – On my last night in town, one of my students invited me to a hockey match between Severstal and CKA (Sports Club of Armine). She tipped me off to a fun sports story involving CKA team members (who also played in the NHL, back in the day) and ballet dancers. I’ll edit that story soon. 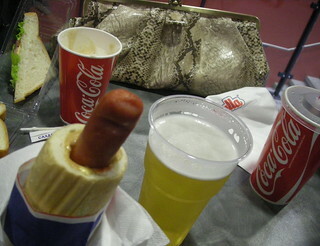 Between periods, I ordered a “French” dog and Russian beer. Everyone leaves the rink to eat in the lobby. That probably explains why everything is so clean and well maintained inside. I shot this video with my Nikon Coolpix camera. I was trying to save my Kodak Zi8 batteries for the hockey player interview. Inside the rink – high energy from the fans and some frustration over all those missed goals. Severstal won the match, 3 to 0. 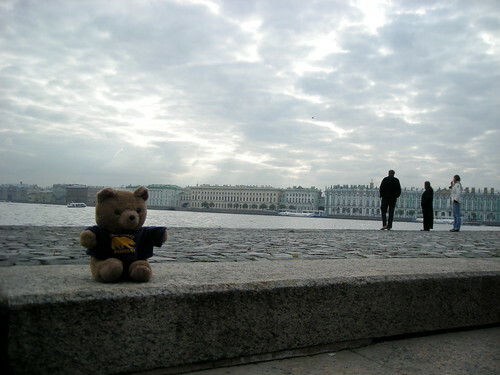 ST. PETERSBURG – “We don’t have bears in Russia,” said one of my students. Fair enough. 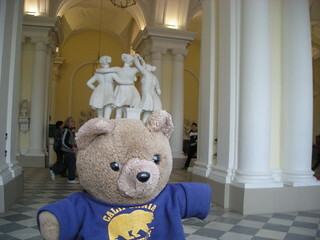 So, I brought my own world-weary bears to St. Petersburg. This time, Andre had a chance to check out the sights and sounds of the Historic Heart. 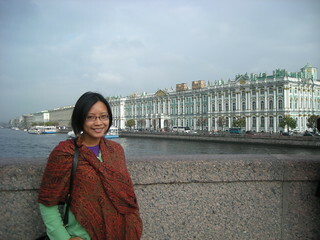 I had some free time before my classes, so we did our own walking tour over the Neva River. Now Andre wants to share his thoughts on our excursion. 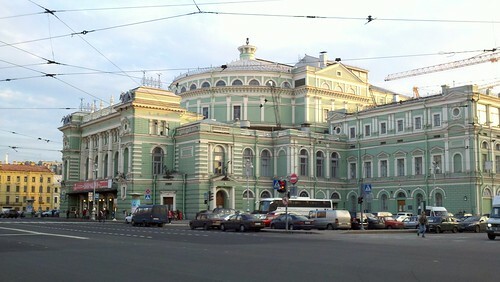 ST. PETERSBURG – I wrapped up my day at the Russian Museum and a Russian brewery in Historic Heart. The Metro ride protected me from the evening rain storm. And, the Metro offered me a lovely concert as well. I paused for this lovely trio playing beautiful music at the Sportivnaya Metro. ST. PETERSBURG – I ran into a sea of white t-shirts after my Saturday morning class. Young walkers and runners told me this was a 10 K event for St. Petersburg women. Hundreds of women, teens and kids hit the streets around the Neva river. Some cheered, sang and others were focused on running. It was fun to interview some of the ladies participating in the event. Also – I’m a little annoyed that I left my running shoes behind in the States. 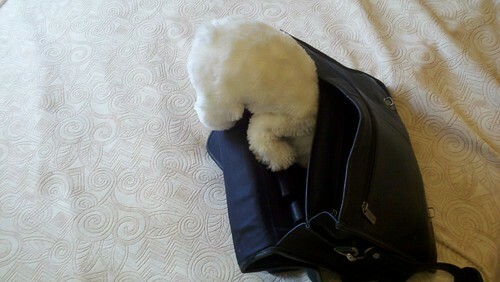 ST. PETERSBURG – Sometimes, pay back can be a bear. 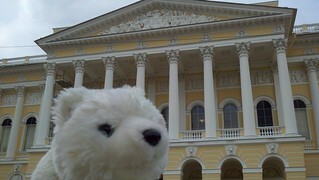 As you can see, Louie wanted to make sure he had a chance to do some sightseeing in St. Petersburg. 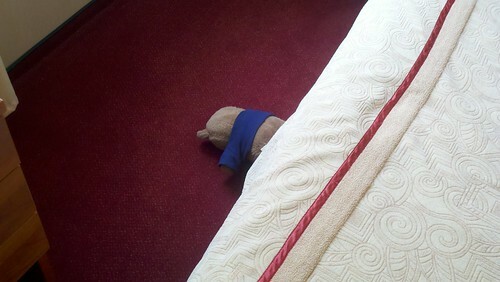 It took my bears a few days to get over the jet lag. I think by the middle of the week, they were going stir-crazy in the hotel room.